How can private and family businesses build an engaged and effective board of directors to copilot through today’s turbulence? Learn from experienced directors, business owners, investors and experts whose insights can help you improve the effectiveness of your board. Reserve your seat at the governance conference for directors, owners, and advisers of family-owned, closely held and private equity-owned businesses of all sizes. Director, Chair, Corporate Governance and Nominating Committee, Ensign-Bickford Industries, Inc.
Board Chair, Sydney Associates, Inc.
lessons they learned and how they adjusted to create high-functioning, strategic boards. This session offers practical advice on how to build collegiality and effectiveness without “yes men” or disengaged directors. Topics to be addressed include encouaging candor in board discussions, teaching directors about your company history and the dynamics of your ownership group, and managing your board effectively. "Lessons from Government Service and Private Company Board Membership"
"Business Disruption Shaping Private Company Governance"
"Succession Strategies and the Governance of a 102-Year-Old Business"
What makes a successful private company board? There’s no one answer, and one approach doesn’t work for everyone. That creates complexity as owners and directors strive for the best possible governance that meets the needs of the company. Panelists will discuss board structures that work for their private companies and explore how these boards help their companies achieve their goals. Speakers: Timothy E. Ellsworth, Director, Chair, Corporate Governance and Nominating Committee, Ensign-Bickford Industries, Inc.; Manuel Diez, Chairman of the Board, President and CEO, Diesco Ltd.; Roberta Sydney, President, CEO and Board Chair, Sydney Associates, Inc. This workshop will explore how a private company board can help establish a healthy culture. Topics to be addressed include how to recognize warning signs of cultures at risk, organizational metrics and information sources for assessing corporate culture, and leading practices for effective director oversight and committee responsibilities. A private company board can be effective only if there is an atmosphere of trust among company management, owners/family members and directors. This session will offer real-world best practices on how to create effective family or owner governance (through family and owners’ councils) and develop systems for effective communication between shareholders and the board. Identifying, developing and training management and family members for board roles. When a successful family business evolves into a sophisticated family enterprise, the complexity of what the family owns increases as the family grows or the entities expand. Family decisions about complexity and about ownership determine governance structures. Board members must understand these ownership structures when making decisions, since the shareholders could be individuals, family trusts, holding companies, investment partnerships, or philanthropic entities with future rights to ownership. This session will demonstrate how governance evolves through the generations for complex families, and why a variety of governance structures are used by sophisticated families. How to evaluate your board's performance, refresh your board and assemble a set of directors who are diverse in terms of experience and background. What skills do you need? What are the advantages of a board that is diverse in terms of gender and ethnicity? "Our Board Journey, and Why I Hired My Own 'Boss'"
All private companies should push management to address the impact of digital disruption, whether it’s the ‘Amazon’ effect, cybersecurity or such emerging technologies as blockchain.This session will offer real-world guidance on how the board can maintain ‘noses in, fingers out’ with management and still ensure the company has solid strategies for the digital future, while minimizing the risk involved. Timothy E. Ellsworth joined EBI as a summer employee in 1968 and is a permanent employee in 1976. After various executive roles at EBI’s Darworth Company, Ensign-Bickford Optics, Corporate Development and Corporate Research units, Mr. Ellsworth formed and led Ensign-Bickford Coatings Company and was CEO of Advanced Glass Treatment Systems (AGTS). In 1994, he resigned from the Company, acquired AGTS from EBI and joined the EBI Board of Directors as a fifth generation family member and successor to his father, John E. Ellsworth, former President and Chairman. Mr. Ellsworth serves on the Audit and Proxy Committees and formerly chaired the Corporate Governance and Nominating Committee. In addition to his Board work for EBI, Tim is CEO of The Peak Experience, LLC, a real estate investment company, and participates on various other corporate and non-profit boards. He is also a former member of the Simsbury Economic Development Commission and Zoning Board of Appeals. Mr. Ellsworth holds a BFA degree from St. Lawrence University and completed his MFA and MBA degrees at R.I.T. Roger and his brother, Paul A. Koch are the third generation in the real estate investment and development business and jointly own Koch Development Company. As Principals and board members, Roger and Paul are responsible for the overall strategic direction of the company. In his 50 years of experience in the real estate business, Roger Koch has served in various capacities as developer, residential home builder, and head of property management and leasing. In addition to his work in Koch Development Company, he was the majority owner and controlled numerous partnerships outside the family business investing in properties in Missouri, Minnesota, Michigan and Illinois. He was a NASD licensed Broker/Dealer for Direct Participation Programs, licensed insurance broker and licensed real estate broker. He has handled the sale, acquisition and financing of numerous properties for Koch Development Company and its affiliates. Best described as the yellow brick road of life, Ivy Silver’s professional and personal life is guided by a few key principals – give everything you have to what you care about, bring excellence and compassion to what you do and learn all you can about doing your work well. She began her career as one of countries youngest museum directors before returning to the Wharton School of Business to become a serial Entrepreneur. In 1981 Ms. Silver founded an industry leading employee benefit consulting firm with multiple profit lines for regional and national corporations, professional associations and non-profit organizations. As a thought leader Ivy was a frequent public speaker on trend setting insurance and risk management concepts, authored numerous articles for industry publications and was an advisor to such luminary organizations as Aetna, Prudential and UNUM insurance. The National Mediation Labor Relations Board highlighted her groundbreaking work with the trustees of the Amtrak Health and Welfare plan for creating change in an environment not previously known for innovation. In 2008 Ivy sold her company, The Commonwealth Consulting Group, to publicly traded Arthur J. Gallagher Company (AJG) where she worked until 2014. Today, Ivy is a principal founder of Mily-on, a conceptual architectural products design that has recently been awarded a series of utility and a design patents for commercial lighting system. She has also formed Sparkplug Innovations, a design thinking and strategic re-visioning company doing work with privately held firms and is certified by The Institute for the Future as a practitioner of Forecasting and The Institute of Culture in Technology of Participation. Ms. Silver received her Governance Fellowship designation from the National Association of Corporate Directors in 2013 and is an independent director of publicly traded Fulton Bank, the largest affiliate of Fulton Financial Corporation (FULT). Ivy is an Advisor to Recovery Record, a privately-owned start-up mobile tech company, member of the private board CIMG and is currently chair of the Public Experience and Marketing Committee of The Academy of Natural Sciences of Drexel University where she serves on their executive and governance committees. Ms. Silver is the immediate past Chair of the Board of the Abington Health System Foundation, a member of the Innovations Committee of Jefferson Health, a board member of the Oda Foundation – an on the ground healthcare organization in Nepal and was recently elected to the Greater Philadelphia Culture Alliance Board of Directors. Ms. Silver is a 2005 Pennsylvania’s Best 50 Women in Business honoree, the Women’s Way Leadership Award winner in 2006, and is a member of the Pennsylvania honor roll of Women Leaders for 1996. She is a dedicated member of Women Corporate Directors, the National Association of Corporate Directors, and The Forum for Executive Women. Chris Herschend is a third-generation shareholder and Vice Chairman of Missouri-based Herschend Family Entertainment Corporation, the largest family-owned themed attractions company in the US. HFE properties span 26 locations and 10 states, employing over 10,000 men & women who collectively host over 13 million guests annually at properties including Silver Dollar City in Branson, MO, Dollywood in Pigeon Forge, TN, Darien Lake in Buffalo, NY, and the world-famous Harlem Globetrotters. Chris is also the majority owner and President of Ride The Ducks International, the world's largest operator and licensor of amphibious sightseeing tours with 8 locations across the United States & Guam. Chris has been elected by the shareholders to serve on the HFE board of directors since 1997 and has served on the audit & compensation committees of the board. Prior to joining Herschend, Chris worked for Coca-Cola, Cox Communications, and an Atlanta venture capital firm. He earned both his BA (1995) and MBA (2003) from Emory University in Atlanta. Chris and his wife Ashley have four young children and live in Atlanta, GA. Chris' current & past community/industry service roles include the International Association of Amusement Parks & Attractions (IAAPA), the Georgia Chamber of Commerce, Young Presidents Organization (YPO), Durban Youth Missions, Atlanta Youth Academy, The Church of the Apostles (Atlanta), the Georgia Center for Opportunity, and Blue Skies Ministries. Sasser Family Holdings (SFH) is a family-owned 4th generation transportation asset management leasing company based in Schaumburg, Illinois. Established in 1928 as a rail car leasing company, SFH recently hired their first non-family CEO when Fred Sasser (G3) moved into the Executive Chairman role of their fiduciary board. Rebecca Sasser Peterson is one of three non-independent directors on the board of eight members and currently serves on both the Governance and Compensation Committees. Prior to her board service Rebecca chaired the Sasser Family Council and remains involved in family governance. She also serves on the Loyola Family Business Center's Advisory Board. While originally from Chicago, Rebecca and her family now live in Elgin, IL. Craig J. Duchossois is the Chairman and Chief Executive Officer of The Duchossois Group. Craig also serves on the Board of Directors of Amsted Industries and Churchill Downs, Inc. He also serves as an advisory board member for The Edgewater Funds and the Marine Corps Scholarship Foundation. His not-for-profit board memberships include Culver Educational Foundation, Illinois Institute of Technology, University of Chicago, Kellogg Graduate School of Management, University of Chicago Hospitals, World Business Chicago, and the Chicago Council on Global Affairs. Additionally, he is a member of the Chief Executives’ Organization, World Presidents’ Organization, Executives’ Club of Chicago, Economic Club and the Civic Committee of The Commercial Club of Chicago. Craig is a past-Chairman of the Board of Visitors for the United States Naval Academy. Craig holds a BBA and MBA from Southern Methodist University. He served as an officer in the U.S. Marine Corps between 1968-1971. He and his wife, Janet, have two children and five grandchildren. Ashley Duchossois Joyce is president of The Duchossois Foundation, and a director of the Duchossois Group, which recently made thee transitions to a full fiduciary board with independent directors. She is a licensed individual, couples and family therapist. Ashley graduated from the University of Colorado at Boulder with a BA, and from the Universty of Chicago School of Social Service Administration with an AM. She is also the Vice Chair of the Board for non-profit Metropolitan Family Services. Roberta Sydney is an independent board director and entrepreneur. Roberta chairs the Compensation Committee and serves on the Board of Plaxall, Inc., and serves on the Advisory Boards of several private real estate technology companies, including Rental Beast, Embue, and Doorbell. She also chairs the Sydney Associates Board and Investment Committee, skillfully managing the complicated dynamics surrounding family succession and transition. Larry Putterman was CEO, chairman and board director of SafeData, LLC, a data backup and recovery solutions company serving corporate clients that he sold to Data Storage Corporation (OTCBB: DTST) in 2010. Subsequently, he has served on Data Storage Corporation’s board of advisors and directors and was an active member of its Mergers and Acquisitions Committee. Prior to SafeData, Larry was founder and president of both American Sports Company and Pan American Sports Company in the Dominican Republic, for more than 20 years. These two companies became the largest independent contract manufacturers of men’s and women’s shoes and components in the Dominican Republic with 1,500 manufacturing employees. Clients included well-known brands like Timberland, Sperry Top-Sider, Sebago, Polo, LL Bean, Nike and New Balance. Larry also honed his management skills in family business as the chief operating officer of Milton Shoe Company in Milton, Pa. and Cinderella Shoe Company in San Lorenzo, Puerto Rico. These companies made over 15,000 pairs of shoes per day that were sold through major retailers. His extensive current and previous board experience include IPC Global Solutions, CDC Software LLC, Audio Ops LLC, Data Storage Corporation, Northern Central Bank, SafeData LLC, American Sports Company, Pan American Sports Company, Milton Shoe Company, Cinderella Shoe Company, and Susquehanna Investment Network. Larry is a member and holds a Masters Professional Director Certification from The American College of Corporate Directors. Jon M. Peterson is the Chief Executive Officer of Peterson Companies, one of the largest and most admired privately held real estate companies in the Washington DC area. Founded 53 years ago, the company is responsible for some of the most prominent and successful mixed-use retail, residential and office developments in Northern Virginia and Maryland including Fairfax Corner, Fair Lakes, National Harbor, Virginia Gateway, Downtown Silver Spring, RIO Washingtonian, Burke Centre and Tysons McLean Office Park. In 2016, he assumed the role of Chairman of the Executive Committee which oversees all aspects of the retail, residential, commercial and mixed-use development and management. Prior to that, Jon served as Senior Vice President of Commercial and Business Development which allowed him to develop close ties to the entire metropolitan real estate community. Jon and the Peterson Family believe passionately in giving back to the communities they serve. Jon has served on numerous philanthropic boards and committees including Joe Gibb’s Youth for Tomorrow and Inova Hospital’s Life With Cancer. He currently serves as Vice Rector of the Board of Visitors for George Mason University, a member of the Board of Trustees at Inova Health Care Systems. He is a member of The 2030 Group, Northern Virginia Transpiration Alliance and NAIOP. Doug Baumoel is the Founder of Continuity, LLC and offers an extensive background in family business operations and executive management in his work with clients. He served as a second-generation executive in his own family’s business and has held key executive positions in other family and non-family businesses. Doug started and ran businesses in both the U.S. and Europe, and lived overseas for six years while establishing and managing the European offices of his family’s business. He has applied more than 20 years of business experience to the development of a process for analyzing key variables affecting family business conflict. Early on in his career, prior to joining his family’s business, Doug served as an internal consultant in strategic planning for Sperry Corporation (Unisys) and as an engineer at Polaroid. Doug is the co-author, with Continuity Managing Partner Blair Trippe, of Deconstructing Conflict: Understanding Family Business, Shared Wealth and Power. This recently published work is the ultimate guide to Continuity’s unique developmental approach to conflict management in family enterprises. A highly-regarded thought leader on conflict management, leadership and governance in family enterprise, Doug has authored or co-authored articles and chapters for numerous professional publications and journals – including Family Business and Massachusetts Family Business magazine; the Thomson West Alternative Dispute Resolution Practice Guide; Private Company Director magazine; and Negotiation Journal of the Harvard/MIT/Tufts Program on Negotiation. His extensive speaking and facilitation engagements include the Campden “America’s Families in Business” conference; FFI’s annual international conference; Transitions East; and the Smith Family Business Initiative at Cornell University along with Suffolk University Law School; Northeastern University Business School; Babson University; the Massachusetts Bar Association; American Bar Association; Massachusetts Probate Council; Boston Private Bank; several regional estate planning councils and various national industrial conferences in multiple industries. Doug earned an MBA from the Wharton School at the University of Pennsylvania and a BS in Electrical Engineering from Cornell University. A dual certificate holder in both Family Business Advising and Family Wealth Advising from the Family Firm Institute, he has been awarded the additional distinction of FFI Fellow. Among Doug’s numerous professional achievements, he holds a certificate in Civil Mediation from MCLE and is a graduate of the Director Professionalism program of the National Association of Corporate Directors (NACD), which recognized him with Fellow status. Doug also served as President of the New England chapter of the Family Firm Institute. Theodore Sharp is a Senior Client Partner for Korn Ferry Hay Group, based in the firm’s Boston office. He is a member of the Executive Pay and Governance team. Mr. Sharp consults with clients extensively in compensation related issues, specializing in the area of executive compensation. In-depth relationships are the hallmark of Theo’s consulting philosophy and understanding the people, business strategy, and competitive landscape of his clients help him provide the best possible advice regarding compensation strategy incentive alignment. Informed, practical advice are what his clients rely on year after year, whether they are developing a whole new incentive strategy or just as a sounding board for new ideas. These principles are applied to clients at all stages of development, from pre-IPO to mature public companies. Mr. Sharp’s specific areas of expertise include incentive plan design, executive compensation benchmarking, employment and severance agreement design and evaluation, Golden Parachute excise tax mitigation and calculation, non-qualified deferred compensation and the tax and accounting treatment of equity compensation. Mr. Sharp has a diverse client base that includes publicly traded companies, private and family owned businesses, pre-IPO companies as well as not-for-profit entities such as foundations and Universities. His clients represent a broad array of industries with a focus on technology and life science. Mr. Sharp has a Bachelor of Science degree in finance from the University of Colorado Leeds School of Business and earned a Juris Doctor from Northeastern University. He is a member of the Massachusetts Bar. Located in the heart of our nation’s capital, The Westin Washington, D.C. City Center is a vibrant hotel that captures the city’s dynamic spirit. The hotel has recently completed a multimillion-dollar transformation that has included dramatically-redesigned accommodations; public areas, including the lobby and a new 24-hour fitness center; meeting venues; and Fringetree, the new signature restaurant. The 406 newly-transformed guest rooms and suites are designed with your comfort in mind. Sleep well in the Heavenly® Bed and refresh in the Heavenly® Bath. Mini-refrigerators and 50-inch LCD flat screen TVs add a touch of aesthetic functionality. Every room also offers wireless High Speed Internet Access and 24-hour room service. Reenergize in the all-new 24-hour WestinWORKOUT® Fitness Studio, featuring state-of-the-art weight machines, free weights, and cardio equipment. Blending modern design with healthful menu offerings, Fringetree is an innovative restaurant and lounge that provides the ideal atmosphere for a delectable meal or handcrafted cocktail. Fringetree’s grab-and-go counter serves Starbucks® coffee, breakfast sandwiches, and light fare. 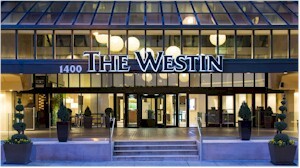 The Westin Washington D.C. City Center’s central location makes it easy to appreciate the world-renowned buildings and historical monuments found throughout the city. The hotel is served by two metro stations: McPherson Square on the Blue/Orange lines and Farragut North on the Red line. The Washington Convention Center is just five blocks east, and the White House is five blocks south. Shops, restaurants, and nightclubs are just four blocks west on Connecticut Avenue. A limited number of rooms are available at a special conference group rate of $299 per night which includes complimentary guest room internet, plus taxes which are presently 14.5% and subject to change. Reservations must be made prior to the cut-off date of Tuesday, April 25, 2018. Reservations may be made online here. The hotel is located close to three airports: Reagan National Airport, 4 miles; Dulles International Airport, 27 miles; and Baltimore Washington International Airport, 32 miles. Directors & Boards, Family Business Magazine and Private Company Director invite owners, shareholders and board members of privately-held companies to the Private Company Governance Summit 2018, May 16-18, 2018, at the Westin City Center, Washington, D.C. The sixth annual Private Company Governance Summit is the only national conference focused exclusively on the unique governance challenges of privately-owned businesses, including closely-held companies, family-owned companies and private equity-owned companies.